LOCATION: Full sun is important. Shady situations will cause weak, spindly sprouts. PLANTING: Dates usually recommended are late winter to very early spring but any time in the dormant season is fine. Division or crowns are the common method. Final Spacing: 18 inches -24 inches in the rows, rows 3 -5 feet apart. Asparagus can also be grown from seed but this requires an extra year before harvest. Plant seed 1 inch deep and 3 inches apart after soaking for 24 hours in liquid seaweed or Garrett Juice. Move seedlings to permanent beds when about 12 inches tall. Asparagus plants make a good border around the edge of a garden or along a fence. It can also be planted in random bare spots throughout the perennial garden. Asparagus roots should be planted just under the soil in well-prepared organic beds. Then about 3” of mulch should be added. The following is often recommended and it’s bad advice - too much trouble and a waste of time and money. I used to make the same mistake. Dig a furrow 4 inches wide and 4 to 12 inches deep. Cover the furrow with 1 inch of compost topped by 2 to 3 inches of soil. Firm the soil around the roots. Over the season, fill the furrows gradually as the shoots grow. I admit that some of my early writings recommended this planting in a ditch idea, but as soon as I installed my own plants with normal planting techniques, I forgot about the other silly approach. SEED EMERGENCE: Early spring, but most asparagus is grown from roots. Seed germinates in a range of 60-85 degrees. HARVEST TIME: Anytime there are spears available. HABIT: Asparagus is dioecious (separate male and female plants). Fern-like growth to 4-5 feet in height with at least 6 feet of spread. Red berries on female plants. Shoots come up from rhizomes. CULTURE: Asparagus does best in full sunlight in deep, well-drained, well-prepared soil. It grows well in high-pH soils and more poorly if the soil pH is below 6.0. Test the soil before planting and add lime if needed to adjust the pH to 6.5 to 7.5. Healthy soil, the basic organic program and excellent drainage are critical. The best planting method is to prepare beds as usual with heavy amounts of compost, lava sand, sugar and organic fertilizer. Then add earthworm castings, soak roots in seaweed water or Garrett Juice, spread out the roots and countersink them about 3 inches into the prepared soil, and then add 2-3” of shredded mulch. Partially completed compost can be used for mulch. Plantings should last at least 15 – 20 years, probably longer under an organic program. In late fall, spread a 1-3 inch layer of quality compost followed by 2” of shredded native tree trimmings. Adding more organic fertilizer at this time is also helpful. 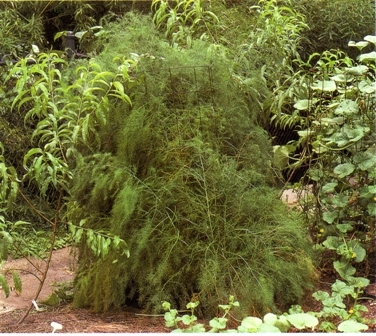 Asparagus plants need frequent, deep watering. Water the beds thoroughly and allow the top 1 inch of soil to dry before watering again. The time varies depending on soil type and temperature. Overwatering can cause crown rot and loss of new or established plants. Asparagus starting to grow in the spring. HARVEST AND STORAGE: Edible shoots are harvested as they emerge in the spring, early summer and throughout the summer. It’s advised to not harvest many, if any, of the shoots the first year. I don’t agree with that. The plants need to produce foliage to make food to build a strong root system, but harvesting some of the spears and letting others leaf out and mature is what I do and it works well. However, according to researchers, you can harvest the first year without hurting future year’s yields by planting year-old crowns. Harvest the spears when they are 4 to 10 inches long. To prevent the spears from becoming fibrous, harvest at least every other day. To harvest, snap off the spears by hand at ground level. Store in plastic or glass at 32-40 degrees for 2-4 weeks. I have good luck cutting the plants to the ground once or twice to encourage new crops of spears. There has been no apparent damage to the plants using this technique. Production the following years has been good. After the first hard freeze, cut off the brown fern tops at ground level and mulch the bed with shredded native tree trimmings. Compost the fern tops as with any organic material from the garden. In the south, the ferns may not be killed by a freeze but should be removed in late November when the ferns start to discolor. Any spears that sprout may be removed and eaten. Some gardeners prefer white asparagus, grown by using mounds of soil or mulch to deprive the spears of light. White asparagus has a milder flavor and is preferred in some gourmet cuisine. White asparagus is also grown by covering asparagus rows with black plastic supported by wire hoops. The covering is opened on one side for harvest, then placed back again immediately after harvest. I think both of these techniques are goofy! Green asparagus tastes better and is much more nutritious. TROUBLES AND SOLUTIONS: Crown rot, spider mites, slugs, snails, cutworms and other fungal diseases are possible, but none of these troubles are serious if the soil is healthy and drains well. Fusarium root rot and other harmful fungi can be controlled with cornmeal at 25 pounds per 1,000 square feet. The most significant pest is the asparagus beetle. Left unchecked it can damage asparagus in a short period. The beetle overwinters in crop residue or trash in the garden or in the border. If you see beetles feeding on asparagus, remove them by hand or spray with Surround (kaolin clay), orange oil products or spinosad products. Application of beneficial nematodes in the early spring will basically eliminate this problem. Weeding should be done by hand in asparagus beds. The herbicide Roundup (glyphosate), available at garden centers, is best used as a broadcast application against weeds before asparagus growth begins in early spring or after the last harvest before ferns are allowed to develop. To avoid injuring the crown, make sure no spears are present when applying Roundup. Roundup should of course never be used anywhere. NOTES: Asparagus plants are dioecious which means that the male and female flowers are borne on different plants. The male plants live longer, emerge earlier in the spring, and do not produce fruit that will compete with the roots and crown for nutrients.Cold weather helps produce larger shoots. Asparagus production is directly related to beneficial fungi in the root systems. It is reported that male plants produce more spears, but females (with red berries) produce larger spears but have a higher mortality rate. I’m not sure about that. Asparagus is good source of vitamin A and C and minerals. VARIETIES: Some of the recommended choices include Mary and Martha Washington, Ben Franklin, Jumbo Jim, Jersey Gem, UC 157, Jersey Knight and Jersey Giant. Be sure to check with local experts about the best for your area. Warm parts of the country need to be the most careful about what varieties to use. Male asparagus cultivars are generally more productive and resist disease better than the female cultivars. Also, female cultivars are less vigorous and produce many red, berrylike fruits that can “volunteer” in the garden. A purple asparagus cultivar (‘Purple Passion’) is available.